When the Lords Apostles asked him to teach them how to pray this is the answer the Lord Jesus gave to them. Are You Ever An ‘Airhead’ While In Prayer, Or Are Those A ‘Trance’ Or ‘In The Spirit’? I’m just asking a question here folks, I’m definitely not trying to be judgmental. But once in a while do you find that while in a quiet personal prayer, that your mind has wondered? Had skipped away in total accident with no wish or intent, to someplace else in your mind? You know that of all times that you/I would always want to be at our best spiritual, physical and mental behavior is when we are having a ‘private moment’ with God, right? When I have done that, skipped off somewhere else in my mind while in prayer, up till this evening I have been upset with and/or disappointed with myself when I realize what I had done, again. I have wondered sometimes if this is what some folks refer to as being in some type of trance, or is it being a stoner and zoning out? Or, is it possible that while in these quiet moments that while we were in prayer, that when this happens that we fell asleep? Whew, hope not. This is one of those cases where I cannot answer for other folks, this is a private individual thing between our self and God and most assuredly, He knows the answers. For the folks in the world that have no faith at all a good many of them must think that those of us who prefer to pray quietly several times a day are out of tune anyway. Yet for those of us who do believe in a loving and all-powerful God and Creator of all of us, faith is all we have got, yet it is all that we need, any of us. When we pray do we have the faith that we are communicating directly with God through His Own Spirit that indwells the Believers? So, how important is it when we are in a silent prayer with God? How important is it that we stay ‘on tune’ during those times? Well, I guess, that’s up to each one of us privately with ourselves, and of course, also on how it is that God looks at these mental phenomenons. This is just my thought for the evening, hope it gave you a thought or two as you were reading it. What One Word Describes our Life; The One We See In Your Mirror? When it is just you, alone, with just your thoughts late at night, can we be honest even then? When we have no one to lie to, no one to impress, do we even know what the truth about our own self is? When we blend in all of the really good things that we did in our past life (time up to this point) along with all of the ignorant and cruel things that we did (even if our ignorance is our defense), how does the picture look to us when it (our life) is all shaken out? This blog is really about conversation, I want the few folks who do read this blog to think and to look inside ourselves and think about the really cool or nice things that we did but also the really shameful things that we allowed ourselves to do, the sins we have done that are unspeakable. I try to get folks to look at these issues when it is just you, yourself, and your mirror (and hopefully private prayer time with Jesus). Personally I very much hope that your one word was better than mine. Why would I say that? The answer is simple folks, because so often my ‘word’ is shameful. It is shameful because I know in my heart that most days I function on ‘cruse control’, literally everyday of my life I know in my heart that I could have done better, more ‘good’ if I had just tried harder. My wife and son tell me that I am to hard on myself, yet I wonder if that is what Jesus will say at my judgement. “Does America want kind of a jerk as president?,” Stephen Colbert asked the 39th president on “The Late Show with Stephen Colbert,” after inquiring whether Carter had been “too nice” to be commander-in-chief. “Apparently, from this recent election, yes. I never knew it before,” Carter answered. “But I’ve changed my mind lately,” he continued. The 93-year-old former president told Colbert that he prays for Trump, but he wasn’t sure if his prayers would be answered. “I pray that he’ll be a good president, and that he’ll keep our country at peace, and that he’ll refrain from using nuclear weapons, and that he will promote human rights. 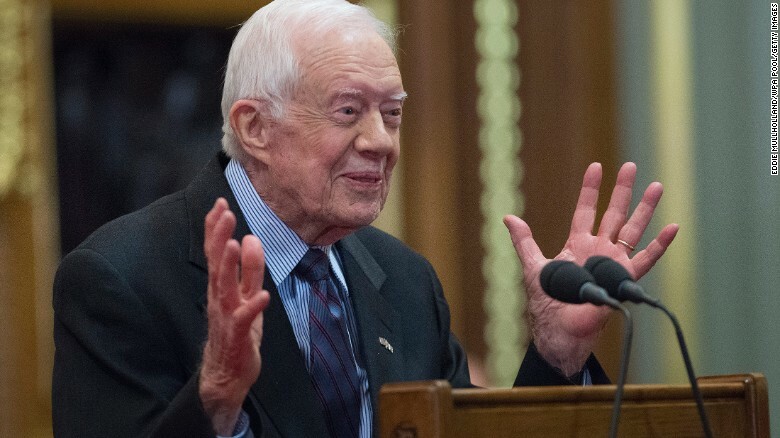 So, yeah, I pray for him,” Carter said. Carter also offered his thoughts on North Korea, reiterating his opposition to sanctions. He told CBS News last week that he had received a briefing from the Trump administration on North Korea and that he’d be willing to travel to that nation on the current administration’s behalf. CNN’s Nicole Chavez and Betsy Klein contributed to this report.